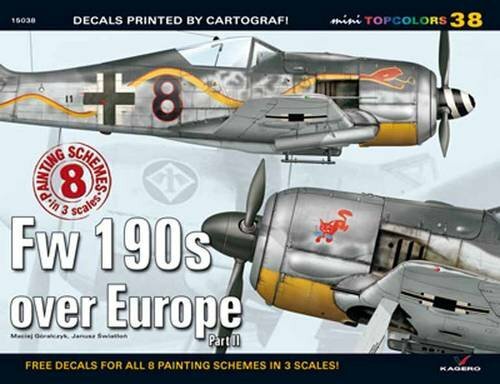 Fw 190s over Europe Part II (Mini Topcolors) de Maciej Goralczyk, Janusz Swiatlon está disponible para descargar en formato PDF y EPUB. Aquí puedes acceder a millones de libros. Todos los libros disponibles para leer en línea y descargar sin necesidad de pagar más. A big decal sheet with 1:72, 1:48 and 1:32 individual markings for 8 colourful "Butcher Birds". The decal sheet was printed by Cartograf. Each painting scheme is depicted on beautifully drawn 4-view colour profiles and described in the 16 page guidebook with English and Polish text. The authors selected the following aircraft: - Focke-Wulf Fw 190 A-2; W.Nr. 0125228, 'Chevron L', flown by Ofw. Erwin Leibold of Stab I./JG 26, St. Omer-Arques, France, July 1942, - Focke-Wulf Fw 190 A-2; W.Nr. 0125299, 'Blue 2', flown by Lt. Leopold Wenger of 10. (Jabo)/JG 2, Caen-Carpiquet, France, mid-August 1942, - Focke-Wulf Fw 190 A-4/U7; W.Nr. 0147092, flown by Hptm. Wilhelm-Ferdinand Galland, Kommandeur of II./JG 26, Vitry-en-Artois, France, spring 1943, - Focke-Wulf Fw 190 A-7; W.Nr. 430170, 'Yellow 5', flown by Lt. Hans Ehlers, Kapitan of 3./JG 1, Dortmund-Brakel, Germany, late December 1943, - Focke-Wulf Fw 190 A-8/R6; probable W.Nr. 171172, 'Black 8' of 3./JGr 10, Redlin near Parchim, Germany, January 1945, - Focke-Wulf Fw 190 A-8/R2; 'Red 10', flown by Ofw. Karl Rusack of 5./JG 300, Lobnitz, Germany, January 1945, - Focke-Wulf Fw 190 A-8; W.Nr. 737435, 'White 20' of 9./ JG 5, Herdla, Norway, 8th March 1945, - Focke-Wulf Fw 190 A-9/R11; W.Nr. 206000, 'White 2' of III./KG(J) 27, Wels, Austria, spring 1945.